Does anyone have a specimen page from Hansen Foundry showing complete font of Lafayette circa 1908? I have a drawer with what appears to be Lafayette mixed with Engravers Old English. Tough enough separating fonts but even tougher without complete specimen as these are pretty close in looks. The page in McGrew’s Metal Typefaces of the 20TH Century only shows a partial specimen. The Lafayette Text, by Hansen, should have a “diamond” nick and, if it is mixed with other foundry Engravers Old English, it should be easily separated. T. J. Lyons had a 10-point font, which I felt was just too small for McGrew’s book, when I was sending proofs to him. That font resides at the Massachusetts College of Art and Design, in Boston, now. If you ever get it separated, please join the APA and submit a specimen card. Many of us did that with 19th- and 20th-century faces, which were not normally shown in McGrew. Thanks for the great information on this. The specimen card had all the info I needed. One other item, that may be incorrect on the card, is the possible transposition of the I and J. 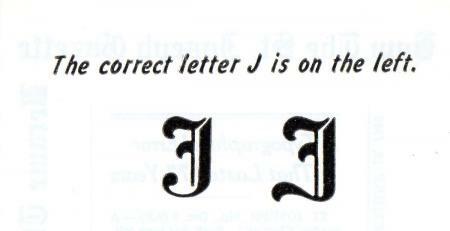 Here is a photo of the 1909 Hansen specimen book, showing the only I or J, in the name Ioseph Lehnhardt. Below that specimen is a showing of Engravers Old English from ATF 1923. I would appreciate any comment as to whether the J should be the one with the curl at the base. Good eye Dave. I remember an APA member once pointed out to the Milwaukee Journal that their “flag” on page one, set in a black letter face, was set with a “I” rather than a “J”, thereby declaring the paper the Milwaukee “iournal”. Sound it out and you’ll see why there was an uproar in the composition dept. John, I believe you might be referring to the late Charlie Bush and the St. Joseph, Missouri Gazette. The Gazette used the cap I rather than the cap J for 77 years until Charlie pointed it out—a typesetter’s mistake made in in 1903. The story made the New York Times. The capital J in the text letters often has an upward hook, while the Capital I has a downward curl. The 1923 ATF book shows complete specimens of their typefaces, and that seems to be true with the text faces shown there—Engravers Old English, Wedding Text, Shaw Text— though there are other variations, too, like Cloister Black, Tudor Black, and Washington Text. Lafayettte Text is not shown in the ATF book, but it is similar to the first three faces I mentioned, so I think samples shown in earlier posts by Dave have the two letters switched. I will try to attach Charlie’s definitive answer here. You are correct, Bob, it was Charlie Bush and another Iournal which was duly chastised. I can’t recall whether the paper decided to alter their flag.